Cement is the most important construction material. It plays a significant role in gaining the strength and durability of the structure. So using standard specified and good quality cement is most important. General introduction and highlights of various testing of cement are already described in our previous article named “Field vs Laboratory Testing of Cement”. Here we are going to discuss the standard consistency test of cement, experiments procedure, uses, acceptance criteria, material requirement, cost of test etc. We need to add Sufficient Water to work with cement constituent, i.e. mortar, concrete, etc. because water plays a significant role in the hydration process. Excess water makes it wet and low water makes it dry. Thus the maintaining the optimum water-cement ratio is most important. A standard consistency test of cement is performed to find out the water content required to produce a cement paste of standard consistency. Consistency is referred to as the ability by a flow of a freshly mixed cement paste or mortar. The consistency of cement is also called as a standard consistency or normal consistency. This is the minimum quantity of water required to initiate the chemical reaction between water and cement content. This is the laboratory test of cement, there are no field tests. The whole test is conducted as a trial and error method. The consistency at which cement paste will permit penetration of Vicat plunger having 10 mm dia. and 50 mm length to a depth of 33-35 mm from top of the mould is defined as the Standard Consistency of cement. By the Standardconsistency test of cement, we can find that how much water is required to produce effective cement paste which will eventually produce good quality of concrete/mortar. The standard consistency of cement paste is used basically, in the determination of water/cement ratio, the setting time, soundness and compressive strength tests of cement. 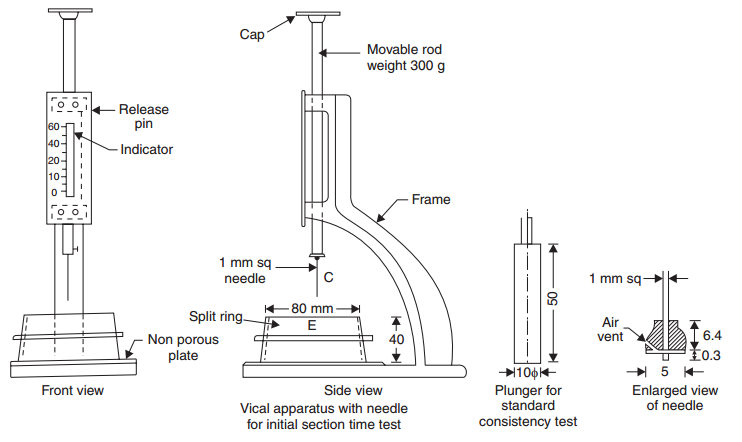 A frame is having a movable rod with a platform at one end and the following needle which can be attached at the other end. (b) Needle for determining the final setting time – It shall be of the same section as a needle for initial setting time, but 30 ±1 mm in length, and fitted with a brass attachment hollowed out, to leave a circular cutting edge 5 ± 0.1 mm in diameter. The depth of hollowed out shall be 0.5 ± 0.1 mm. A 0.75 mm diameter vent hole is provided. (c) Plunger for determining the standard consistency – Plunger shall be of polished brass 10 ± 05 mm in diameter. Vicat Mould: Internal diameter of 70 ± 5 mm at the top, 80 ± 5 mm at the bottom and a height 40 ± 0.2 mm. 02. Weighing Machine: The permissible variation at a load of 1000 g shall be ±1.0g. Take 400 gm of cement for making a paste. We know that for OPC, the consistency is between 25% to 33%. So we started this experiment by using 25% of the cement weight. Prepare a paste of weighed quantity of Cement with a weighed quantity of potable or distilled water. Take care of the time of gauging, it should not less than 3 minutes, nor more than 5 minutes and the gauging must be completed before any sign of setting occurs. The gauging time is counted from the time of adding water to the dry cement until commencing to fill the mould. Fill the Vicatmould with this paste, the mould resting upon a non-porous plate. After completely filling the mould, smoothen the surface of the paste, making it level with the top of the mould. The mould may be slightly shaken for removing the air. Place the mould, together with the non-porous resting plate, under the rod bearing the plunger. Lower the plunger gently to touch the surface of the test mould, and quick release, allowing it to sink into the paste. This operation is carried out immediately after filling the mould. Then note down the reading of penetration from the graduated scale. 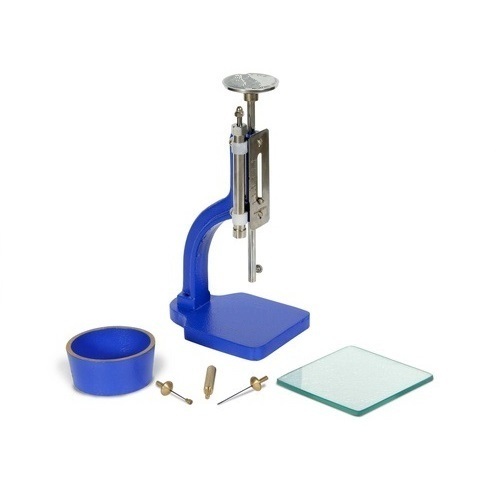 Prepare a trial paste with varying percentages of water and test as described above until the penetration reading is 33-35 mm from top of the scale. Clean appliances shall only be used for the experiments. Temperature and Humidity: experiment to be conducted at the room temperature and the relative humidity of the laboratory shall be around 65 ± 5 per cent. There should be no vibration during the experiment on the working table. The plunger and mould should be cleaned and oil should be applied on the surface during every repetition. The test result should be 33-35 mm measurement from the top of the scale in vicat apparatus. At this penetration, the percentage of water is denoted as a consistency. Generally, the standard consistency for ordinary Portland cement ranges from 26 to 33%. More than this value show that the cement paste might have become extra wet and poor which lead to bleeding and less than this value shows that cement paste might have become harsh which can cause cracks and give a rough surface. The acceptance criteria also depend on types of cement and brand of cement. What should you do when Result is not in Range of Acceptance Criteria? If the test result is not in range of acceptance criteria, then you should find the reason. There are many reasons behind it, i.e. cement may be very fine, some chemical properties might have changed due to any reason, there may be defect during a manufacturing process, cement might have absorbed moisture from the atmosphere, etc. In that case, you have to check these properties through performing the various testing of cement, i.e. fineness test of cement, chemical testing of cement etc. or you can ask your engineer to check these properties. You can also ask your cement supplier/manufacturer regarding this. 400 gm cement for each mould, in laboratory generally 2 or 3 repetitions may be required to find consistency so that around 1300 gm (1200 gm for mould +100 gm supposed to wastage) cement is required for this test. Cost of consistency test of cement is approximately 200 to 400 Indian rupees. Cost is totally dependent on the various factors, i.e. area where test is conducted, the urgency of test results, numbers of the test, relation with client etc. At use of every 50 MT cement. When the source of cement is changed. When the type of cement is changed. When the brand of cement is changed. When the grade of cement is changed. Next PostNext Which are the Best Materials & Finishes to Use in Modular Kitchen?